One of the things I have loved by joining the blogging community is the trading aspect. Being able to flip the cards that don't thrill me into cards that do drives me to continually read all the blogs I see and email many of you writers to propose a trade. And as great relationships are built, you suddenly get cards out of the blue. Someone just decides they have cards you will enjoy and they arrive in your mailbox. This is something I am really enjoying in this community. One such package arrived from Brian at the awesome Play at the Plate. I don't know if we have every really traded. I knew something was on the way when Brian emailed me asking for an address. I have been putting some POTP cards aside to inquire about a trade with Brian - now I can just mail them to him in response to the envelope I received. Brian sent a nice group of 2013 White Sox. INSERTS! Look at all the pretty colors. 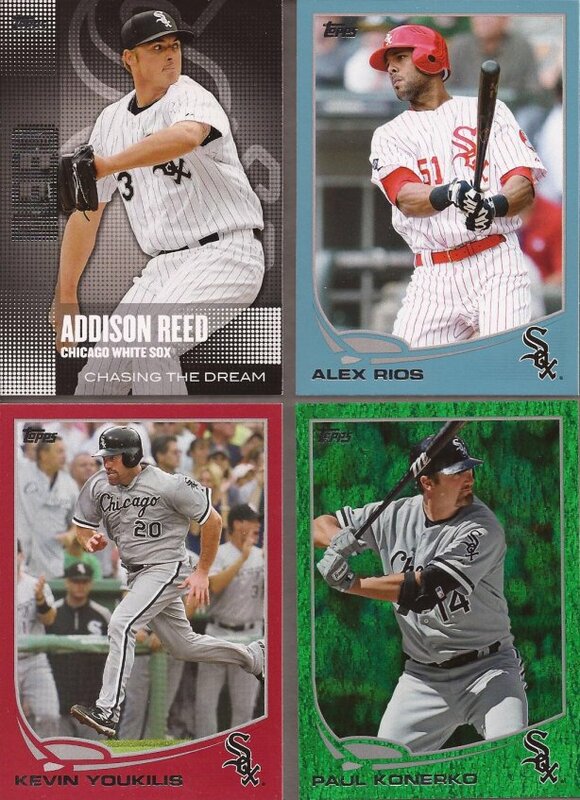 Brian dropped a load of '13 insert cards - a couple of Konerko minis and a dang near complete Walmart blue set. Thanks, Brian. It fills me with such love. Ain't all you're filled with. What I want to focus on the right sleeve of each player. Notice nothing on Thornton's, one diamond on Danks' and two diamonds on Beckham's. For those that were not aware, the diamonds were honoring Moose Skowron and Kevin Hickey's passing during the 2012 season. We lost Moose April 26th and Hickey on May 16th. So - can we tell when these three photos were taken based on the patches? One thing: we are going to have to assume that Thorton's picture is from 2012. The White Sox started the season without a patch on the sleeve. Technically, it could be a photo from an earlier season; let's hope it isn't. Ok, let's start with the easiest one. In Beckham's card, we can see the other team the Sox are facing. It's the Yankees. We know the Sox are on the road. The only time the Sox were in the Bronx was 6/28 to 7/1. We also can see on the card that Gordon is turning a double play. Just one problem - the Sox turned only 3 DPs that series, and the only one Gordon was involved in was on June 30th. The runner forced at 2nd was Curtis Granderson. That is not Granderson's arm on the card. So this photo is an attempt to turn a double play, but the runner beat the throw at first. In the four games, the only force out at 2nd with Beckham receiving the ball, and failing to complete the double play, happened on June 28th. The runner coming from first was Chris Stewart, uniform number 19. That first number on the back of the uniform is a 1. One card down. Moving left, we have John Danks with just the single diamond patch for Moose. We know that by the time the Sox came back from a road trip on the 22nd of May, both patches were on the uniform. The Moose patch first appeared on a home uniform May 11th. The Sox played a short 5 game home stand prior to May 22nd, with Danks having just one start - May 14th. In that game, Danks was pulled in the top of the 4th, so this photo was taken during one of the 22 batters he faced. Card two down. Lastly, we have Matt Thornton. Matt is a reliever, so this is NOT going to be easy. Prior to the May 11th game, Thornton appeared in 5 home games. Can we get enough information from the card and other locations to identify the exact game? April 29th was a Sunday game. The Sox wore red throwbacks for 2012 Sunday games. Eliminated. April 13th and 14th were day games. The shadows are not from the sun but light banks. Eliminated. That leaves either April 16th or May 2nd. 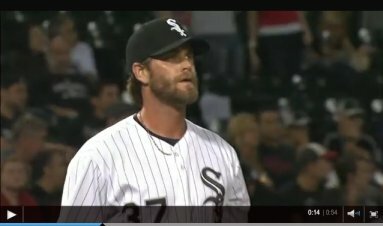 The Sox wore their white pinstripes during both night games. Do we take a guess? Or do we keep digging? Thornton's beard is far heavier and longer than his beard on the card, so we know that we can eliminate May 2nd and be certain the photo on Thornton's card is from April 16th. I knew reading all those Encyclopedia Brown books when I was younger would come in handy. Encyclopedia Brown was the man. Or, I guess, the kid. Wouldn't have pegged you for a McLachlan superfan. "McLachfan"?